Fusion protein, corresponding to amino acids 1-179 of Mouse Dab1. WB: 293 cells transfected with Dab1–HA tag. IP: Mouse p14 brain lysate. Our Abpromise guarantee covers the use of ab16674 in the following tested applications. WB Use a concentration of 1 - 5 µg/ml. Detects a band of approximately 80 kDa (predicted molecular weight: 67 kDa). IP Use a concentration of 5 - 10 µg/ml. Adapter molecule functioning in neural development. May regulate SIAH1 activity. The PID domain specifically binds to the Asn-Pro-Xaa-Tyr(P) motif found in many tyrosine-phosphorylated proteins. Phosphorylated on Tyr-198 and Tyr-220 upon reelin induction in embryonic neurons (By similarity). Also phosphorylated on Ser-524 independently of reelin signaling. ab16674 detecting mouse Dab1 in brain extracts by Western blot. Lane 1: ab16674 (N terminal). Lane 2: ab16675 (C terminal). ab16674 detecting mouse Dab1 in brain extracts by Western blot. Lane 1: ab16674 (N terminal). Lane 2: ab16675 (C terminal). ab16674 has not yet been referenced specifically in any publications. Publishing research using ab16674? Please let us know so that we can cite the reference in this datasheet. 200 nM PMA for 24 hours. Cells in sample 2 were treated with 300 uM hydrogen peroxide for 20 mins before being lysed. Thank you very much for your helpful information. Based on what you&apos;ve sent, I think we would like to try ab111684 in IP. antibodies have been raised in the same species. If you could arrange the discount code, that would be very helpful. helpful. Sorry if I&apos;ve caused any confusion. Please do not worry about the email you sent to us. I have marked this as completed. Thank you for flagging this up to me. Until then, I wish you all the best with yourexperiments. Thank you for contacting us yesterday in regards to antibodies to be used in immunoprecipitation of Dab1 from mouse and human samples. Unfortunately, as discussed over the phone, we do not currently have any antibodies in our catalogue which have been used in immunoprecipitation with both mouse and human samples. The two antibodies we have where they have been shown to work in immunoprecipitation,ab16674 and ab16675, haveonly as yet been tested with mouse samples. The homology of the immunogens used are however very similar and we would therefore expect these antibodies to be able to detect the human protein as well (please refer to the sequence alignment attached).Especially with ab16674 where the homology is 100% (immunogen composed of residues 1-179 of mouse Dab1). Please not that the antibody to be tested must be purchased, tested, the Abreview submitted and the free product claimed within a 4 month period. If you would be interested in participating in this scheme please do let me know as a discount code needs to be issued prior to the purchase of ab16674or ab16675. Alternatively, I would be able to offer the same testing discount if you wanted to try the ab111684 instead. 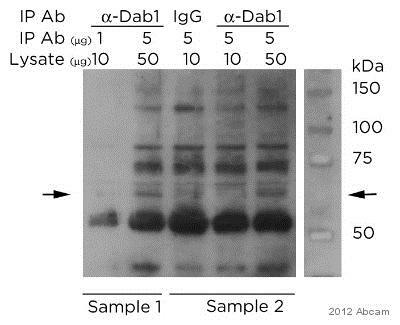 This antibody has been shown to detect both the mouse and human Dab1 protein but has as yet not been used in immunoprecipitation. We would therefore not be able to guarantee that it would work in this application. we would like to test your Dab1 antibodies for imunohistochemical applications. Do you offer free samples for testing ? Thank you for your enquiry. We do not routinely offer free or trial sized samples for testing purposes. Our policy at Abcam is that if an antibody does not work as specified on the datasheet, we will offer a replacement or reimbursement. Should you decide to test an antibody in an application for which we do not have any information, please let us know how you get on and in return we will award you 50 points with the Abcam Loyalty Scheme which can be redeemed on a number of rewards.